Specially formulated to clean hands, tools and surfaces from wet and semi-cured paint, sealant, adhesive, bitumen, expanding foam, oil, grease and even silicone. Particularly useful if there is no water on site. 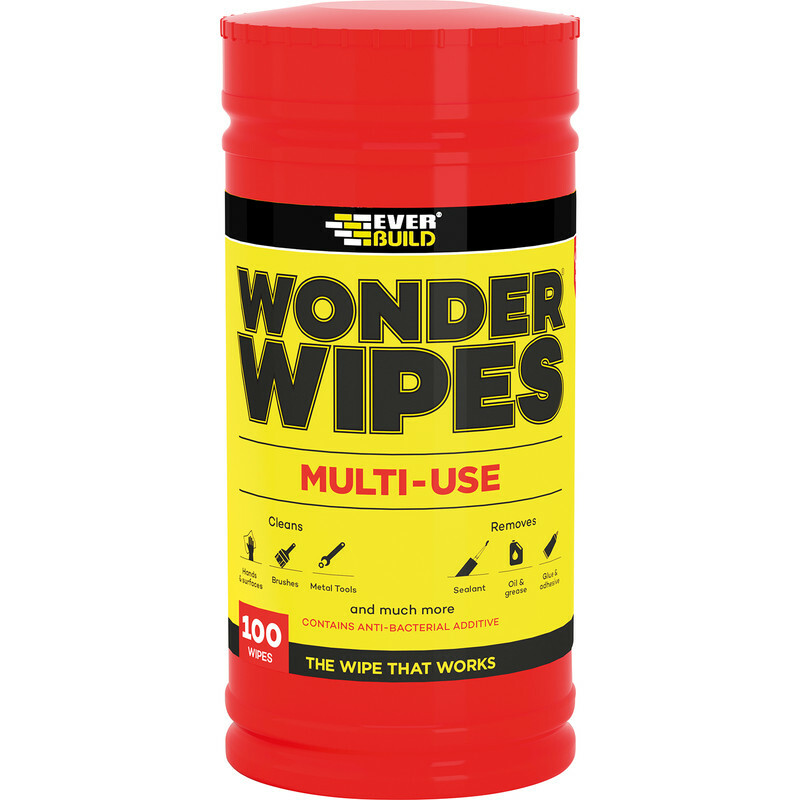 Multi Use Wonder Wipes 100 Wipes is rated 4.7 out of 5 by 15. Rated 5 out of 5 by StuK from Very useful general wipes Have used these wipes a lot to clear up and degrease surfaces. Great for cleaning prior to sealing with silicone and also good for cleaning off sealant from tools/surfaces. Haven't found them negatively affecting any surface yet but do test first if unsure. Rated 5 out of 5 by Bill_M from Very handy wipes There are not many handyman or DIY jobs where I don't find these useful. Great for cleaning paint, removing grease etc. Good for removing fingerprints etc from surfaces like switch plates just b e careful they are not too wet. Rated 5 out of 5 by Vitreous from Excellent product These are really good wipes, they clean almost anything from most surfaces, I would recommend them to most trades. A little more expensive than other wipes, but worth paying extra for something that works. Rated 5 out of 5 by John 12 from Very good Does the job...............! Rated 5 out of 5 by Daizydane from Really, really useful! ? I used these wipes last year when decorating and now wouldn't be without them. Great for removing paint and oil etc from your hands.Also our Dane is very messy when she starts shaking her slobbery head and these are fantastic for removing the resulting mess, even the bits you miss and have dried.